Chairman Scott, Ranking Member Foxx, and members of the committee, thank you for the opportunity to testify today on the importance and necessity of increasing the minimum wage to $15 per hour. My name is Ben Zipperer and I am an economist at the Economic Policy Institute (EPI) in Washington, D.C. EPI is a nonprofit, nonpartisan think tank that believes every working person deserves a good job with fair pay, affordable health care, and retirement security. To achieve this goal, EPI conducts research and analysis on the economic status of working America. A national $15 minimum wage by 2024 is an important corrective to ensure that low-wage workers share the benefits of economic growth. The bulk of recent economic research on the minimum wage, as well as the best scholarship, establishes that prior increases have had little to no negative consequences and instead have meaningfully raised the pay of the low-wage workforce. Minimum wage workers, and low-wage workers generally, are mostly adults and are also disproportionately women and people of color. Workers in every region of the country will soon need $15 per hour to maintain a modest but adequate standard of living. Notes: The productivity series is total economy productivity net depreciation, indexed to the 1968 real value of the minimum wage. Real minimum wage values are in 2018 dollars deflated by the CPI-U-RS (1978–2017), chained to the CPI-U-X1 (1967–1977) and CPI-U (1938–1966). Projections for productivity growth and inflation use Congressional Budget Office, An Update to the Economic Outlook: 2018 to 2028, “10-Year Economic Projections” (downloadable Excel file supplement), August 2018. Increasing the national minimum wage to $15 by 2024, as proposed in the Raise the Wage Act of 2019 (H.R. 582), is an important corrective to our failure to raise the minimum wage. A $15 minimum wage by 2024 would ensure that a portion of the country’s labor productivity gains are translated into higher living standards for low-wage workers. At the same time, the proposal does not raise the minimum wage to $15 immediately, but instead gradually phases in the increase over a period of six years so that employers can adjust to the new standard. The proposed legislation also indexes the minimum wage to median wages so that low-wage workers will share a common trajectory of wage growth with the broader labor market. By establishing regular, predictable increases to the minimum wage that are linked to overall wage growth, the proposed legislation improves the ability of the minimum wage to reduce inequality. A rise to $15 an hour would reverse decades of growing pay inequality between the lowest-paid workers and the middle class, and indexing future increases would prevent any future growth in that gap. Minimum wages are one of the most well-studied topics in economics. Although there sometimes appears to be much controversy about size of the employment effects of the minimum wage, the weight of recent evidence shows that minimum wage increases have worked exactly as intended, by raising wages without substantial negative consequences on employment. Paul Wolfson and Dale Belman reviewed 15 years of research published since 2001—which comprised 37 studies and 739 estimates—and found that the average estimated employment effect of minimum wage increases was very small.5 In addition, Wolfson and Belman, as well as Isaiah Andrews and Maximilian Kasy in a new review, found statistical evidence that there is a bias toward publishing findings showing a statistically significant negative employment effect.6 Finally, Sylvia Allegretto, Arindrajit Dube, Michael Reich, and I found that studies using the most high-quality, credible research designs also found little to no employment effects.7 These findings taken together suggest that both the average study as well as the best research show that there has been little downside to raising minimum wages. The benefits of a $15 minimum wage in 2024 for workers, their families, and their communities will far outweigh any potential costs of the policy. To gain a sense of the large improvements a $15 minimum wage by 2024 will make in the lives of low-income communities, we can turn to research by Arindrajit Dube on how minimum wages raise incomes for the poorest families. In a new article soon to be published in the American Economic Journal: Applied Economics, Dube demonstrates that the income-raising effects of the minimum wage significantly reduce the number of Americans in families below the poverty line.11 In particular, if the U.S. had a $12 national minimum wage in place last year, there would be 6.2 million fewer individuals living in poverty. The resulting income gains and poverty reductions would be especially large for black and Hispanic families and for single mothers. We should expect similarly sized poverty-reducing effects of a $15 minimum wage in 2024, given that such a policy is equivalent to about $13 per hour in 2018 dollars, after adjusting for projected inflation. While the Family Budget identifies what we call “adequate standard of living,” I should note that the budgets are very conservative. In particular, they do not include any amount for saving for retirement or buying a home, or even for emergencies. They simply describe the minimum amount of money a family needs in wage income in order to pay for a limited number of necessities. As an economist, it is striking to me that we, as a country, tolerate a federal minimum wage as low as $7.25 per hour, given the needs documented in EPI’s Family Budget Calculator. The Fair Labor Standards Act was enacted in 1938 “to protect this Nation from the evils and dangers resulting from wages too low to buy the bare necessities of life.”14 Anything less than a $15 minimum wage by 2024 will not adequately carry out this purpose. While minimum wage workers are frequently characterized as mostly teenagers or younger workers, this stereotype is false. Among workers who would benefit from a minimum wage increase to $15 in 2024, the average age is 35 years old. Most low-wage workers are not very young primarily because so few teenagers work at all to begin with.15 For a minimum wage increase to $15 by 2024, about 91 percent of the workers receiving wage increases would be age 20 or older, and 68 percent would be at least the age of 25. The typical worker in a family who will benefit from this minimum wage increase is actually the family breadwinner, earning on average about 52 percent of their family’s total income. In addition to being older, low-wage workers are much more likely to be a woman or a person of color than the average worker. As a result, our current national minimum wage of $7.25 hurts women as well as black and Hispanic workers the most. About 40 percent of all black workers would receive a wage increase, as would about 34 percent of Hispanic workers. Just as the minimum wage can be an important tool for reducing inequality among women, increases in the minimum wage have led to large reductions in earnings inequality between black and white workers. The same research cited earlier by Derenoncourt and Montialoux found that the increases and coverage expansions of the late 1960s were responsible for more than 20 percent of the fall in the black–white income gap during the Civil Rights Era. 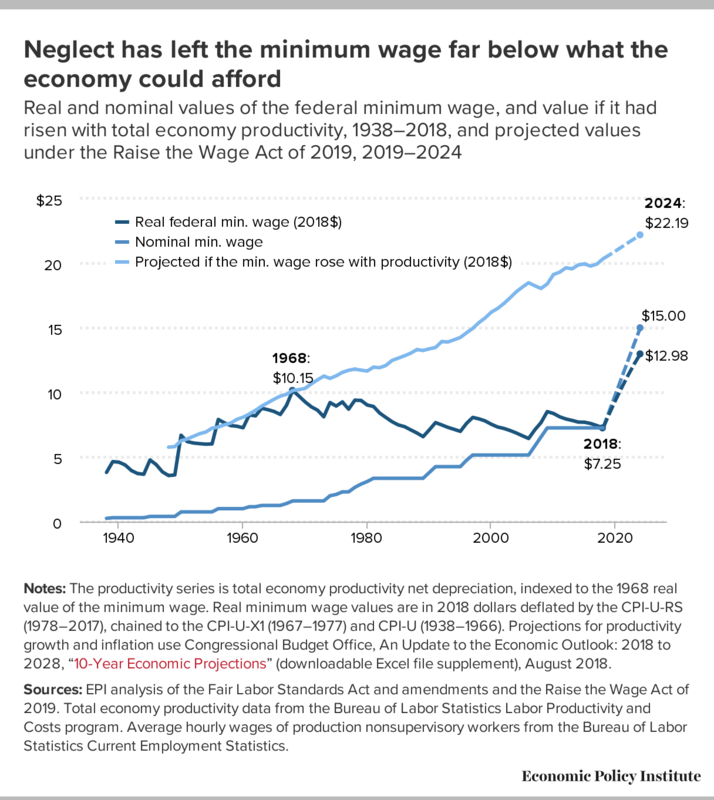 Minimum wages have long been an effective tool for maintaining adequate pay, but the failure to adequately raise the federal minimum wage has denied American workers significant improvements in their standard of living. As a result, the lowest-wage workers today earn significantly less than what their counterparts did five decades ago, after adjusting for inflation. By raising the federal minimum wage to $15 by 2024, we will finally deliver a much-needed boost in wage income and increase the value of the minimum wage to a level that ensures the lowest wages we pay workers are not poverty wages. In addition, by automatically indexing future minimum wage increases to median wage growth, low-wage workers will share a common trajectory of wage growth with the broader labor market. Finally, gradually phasing out the separate lower wage for tipped workers will help to eliminate disparities in labor protections between tipped workers and the rest of the labor force. 1. With an hourly wage of $7.25 per hour working 40 hours every week, a single parent would earn $15,080 annually, less than the 2017 nonelderly poverty threshold of $16,895 for a one-adult, one-child family (see Current Population Survey Time-Series Tables, Historical Poverty Thresholds, “Poverty Thresholds for 2017 by Size of Family and Number of Related Children Under 18 Years” (downloadable Excel file), November 2018. 2. David Cooper, Raising the Federal Minimum Wage to $15 by 2024 Would Lift Pay for Nearly 40 Million American Workers, Economic Policy Institute, February 2019. May 2017 National Occupational Employment and Wage Estimates from the Bureau of Labor Statistics report median annual salaries and median hourly wages of preschool teachers ($28,990 annually; $13.94/hour); bank tellers ($28,110 annually; $13.52/hour), and fast-food and counter workers ($20,240 annually; $9.73/hour). According to the author’s analysis of CPS-ORG data, 25 percent of the employed earned less than $13 per hour in 2018. 3. Projected inflation is from the CPI-U series published by the Congressional Budget Office. See Congressional Budget Office, An Update to the Economic Outlook: 2018 to 2028, “10-Year Economic Projections” (downloadable Excel file supplement), August 2018. 4. Sylvia Allegretto and David Cooper, Twenty-Three Years and Still Waiting for Change: Why It’s Time to Give Tipped Workers the Regular Minimum Wage, Economic Policy Institute, July 2014. 5. Wolfson and Belman’s sample of employment elasticities with respect to the minimum wage had mean and median estimates of -0.06 and -0.03, respectively. See Paul J. Wolfson and Dale T. Belman,“15 Years of Research on U.S. Employment and the Minimum Wage,” Tuck School of Business Working Paper no. 2705499, December 2016. 6. Isaiah Andrews and Maximilian Kasy, “Identification of and Correction for Publication Bias,” Mimeograph, October 10, 2018. 7. Sylvia Allegretto, Arindrajit Dube, Michael Reich, and Ben Zipperer, “Credible Research Designs for Minimum Wage Studies: A Response to Neumark, Salas, and Wascher,” ILR Review 70, no. 3 (May 2017): 559–592, https://doi.org/10.1177/0019793917692788. 9. Ellora Derenoncourt and Claire Montialoux, “Minimum Wages and Racial Inequality,” Mimeograph, November 30, 2018. 10. For a broader version of this argument, see David Cooper, Lawrence Mishel, and Ben Zipperer, Bold Increases in the Minimum Wage Should Be Evaluated for the Benefits of Raising Low-Wage Workers’ Total Earnings: Critics Who Cite Claims of Job Loss Are Using a Distorted Frame, Economic Policy Institute, April 2018. 11. Arindrajit Dube, “Minimum Wages and the Distribution of Family Incomes,” NBER Working Paper no. 25240, November 2018 (to be published in the American Economic Journal: Applied Economics). 12. Economic Policy Institute, Family Budget Calculator, March 2018. 13. Areas here refer to all counties and metro areas. Family budgets here are projected using projected inflation from the CPI-U series published by the Congressional Budget Office. See Congressional Budget Office, An Update to the Economic Outlook: 2018 to 2028, “10-Year Economic Projections” (downloadable Excel file supplement), August 2018. 14. S. Rep. No. 75-884, at 4 (1937). 15. In November 2018, the employed share of the teenage population was 31.1 percent (see Bureau of Labor Statistics, Labor Force Statistics from the Current Population Survey Series LNS12300012, “Employment–Population Ratio, 16–19 Yrs.”) and only 50.5 percent of all 16- to 24 year-olds were employed (see Bureau of Labor Statistics, Labor Force Statistics from the Current Population Survey Series LNS12324887, “Employment–Population Ratio, 16–24 Yrs.”). 16. David H. Autor, Alan Manning, and Christopher L. Smith, “The Contribution of the Minimum Wage to US Wage Inequality over Three Decades: A Reassessment,” American Economic Journal: Applied Economics 8, no. 1: 58–99, https://doi.org/10.1257/app.20140073.